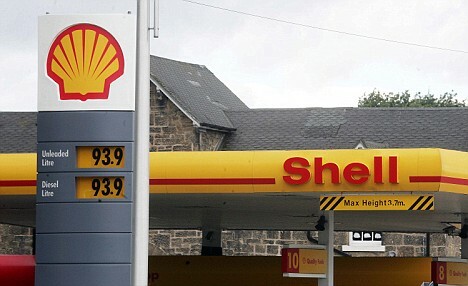 The leaked news, yet to be confirmed but buzzing around the City, that the two regal corporations Royal Bank of Scotland and Royal Dutch Shell are to merge has caught analysts and legislators off their guard. The idea that a failing bank and a struggling oil company should pool there resources seems extraordinary â€“ but no stranger than the bizarre train of circumstances that has led to this apparent accord. The further leaked insider information that the two beknighted ex-CEOs of Shell and RBS, Sir Philip Watts and Sir Fred Goodwin, are to be jointly tasked with the creation of the new global giant has rocked the city to its foundations â€œItâ€™s as if Lehman Brothers went bustâ€ one insider said over a large glass of ChÃ¢teau Margaux 1986. On the face of it the challenge that Sir Philip and Sir Fred face is immense. Whilst their corporate names may be regally resonant their business behaviour for years has been some way short of the monarchical. Both companies have faced criticism from shareholders for the excesses of their director remuneration policy. When Sir Philip received an index-linked pension of more than Â£600, 000 per annum despite having steered Shell perilously towards the rocks even the institutional investors commented adversely – until a corporate box at the British Grand Prix was made available to them. 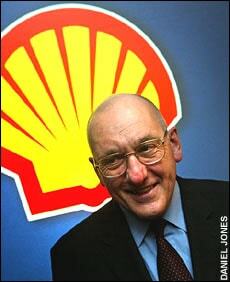 Rumours have it that it was at Silverstone that the alliance between Shell and RBS was first discussed. When Shellâ€™s current CEO Jeroen van der Veer said in his heavily accented English that the last thing that Shell needed was a load of financial â€œwankersâ€ on the Board he was overheard by Lloyds Bank and Shell director Maarten van den Burgh who thought that the word used was â€œbankersâ€. This led to an eventually unstoppable series of events that brought RBS and RDS close together. The breakthrough in the move towards merger came when Shell offered their Dutch director, ex Dutch Prime Minister Wim Kok, the opportunity to hive off the Dutch bank ABN/Amro from the newly merged company. Dutch banking circles had been shocked by RBSâ€™s coup in absorbing the last of the Netherlandsâ€™ banks and Mr Kok, who despite his advanced years is said still to harbour political ambitions, said enigmatically â€œEen leuk kusje voor de Hollanderâ€ as the news emerged. Government circles in Britain and The Netherlands are believed cautiously to have welcomed the news. British Chancellor of the Exchequer Alastair Darling said â€œThis is a good opportunity for Sir Philip and Sir Fred to redeem themselves and we have every confidence that their particular insider trading (sorry inside trading) experience will be invaluable. Set a poacher to catch a poacherâ€ he mysteriously said. And Prime Minister Gordon Brown later commented â€œIt may seem strange but the rectitude of the Scots and the Dutch is well known and the link been the toxic assets of RBS in the sub-prime market and the toxic assets of Shell in Ogoni land shows the symbiosis between these two historically great corporations.â€ Sir Philip Watts added â€œI am pleased to emerge from the wilderness of my Japanese garden to work with my old friend Sir Fred to further build up our Pension potsâ€. No user commented in " RDS and RBS to merge "